Read the latest News and Stories on RYDF, the Dream Team, our Fitness Forever Program, and more. On Tuesday February 26th, 5-time World Champion Rocky Carson hosted a Pro-Am Fundraiser for the Reaching Your Dream Foundation at the club where he plays and teaches. Rocky recruited several of the local area pro players (e.g., Luiz Avila, Brandon Davis, Scott Davis, Greg Solis, and Josh Tucker) and club players and was able to raise $10,000 for RYDF! We’d like to thank Rocky, the pros, and the donors who gave their time and money to support the Reaching Your Dream Foundation. We’d especially like to thank the owners and management of ClubSport Aliso Viejo. If any of those who read this want to consider doing the same thing for RYDF, please contact Mike Lippitt at 510.504.2494 and we will help you set it up. Thanks! It was an epic U.S Open win for RYDF mentors Jose and Markie Rojas, taking first place in the Pro Doubles Division. This was the first US Open win for the Rojas brothers, widely celebrated by their many fans, particularly those in the “209” (the greater Stockton area code). Their win is a tribute to their hard work and long time commitment to nurture underserved members of the Stockton community. Jose and Markie are part of an enormously successful racquetball community in Northern California, started and developed by Pat and Dave Ellis, and continued through their son John. Community key contributors include Jodie Nance and many others, including a racquetball club owner deeply committed to growing racquetball for 20 years at In Shape Athletic Clubs in Northern California. RYDF’s Fitness Forever Program has partnered with the Ellis’ to provide a dynamic community engagement program targeting underserved youth and adults. Key help comes from RYDF supported players including Daniel Rojas, Robbie Collins, Tatoe Rojas, and Ricky Diaz, and others. They provide health and fitness activities at In Shape Athletic clubs. 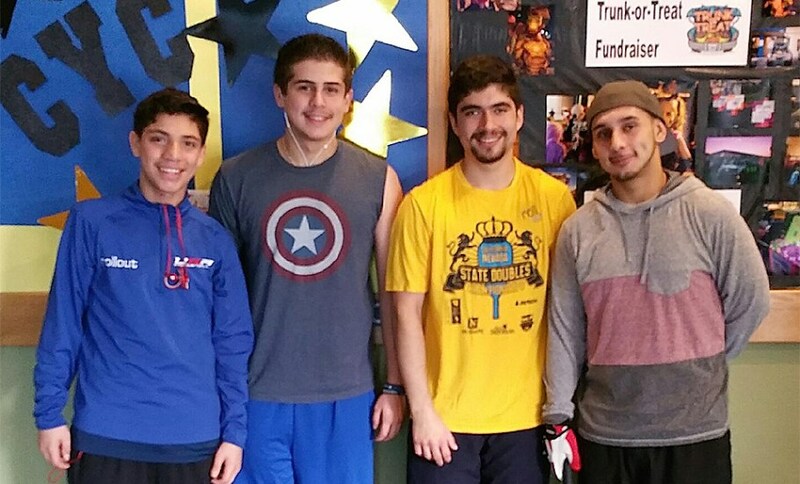 Jose and Markie are long-time leaders, role models and mentors in the Stockton racquetball community to younger players in the successful juniors program at In Shape’s clubs. RYDF’s goal is to help young players both on and off the court. We're equally proud that Jose and Markie are recent graduates from the University of the Pacific. Jose and Markie will continue to provide leadership, support, and mentorship on behalf of the Reaching Your Dream Foundation. Additionally, they'll continue playing professional racquetball and representing the United States on the world stage. RYDF thanks and congratulates Josie and Markie for their community service on top of their hard work and training, culminating in their US Open doubles victory. By what gauge does one judge the state of racquetball in the U.S? From July 15-23 in Cali, Colombia at the World Games, the international racquetball community will be introduced to TEAM USA, the product of the current U.S system. Though some racquetball insiders may judge more critically, the casual fan determines a country’s strength by the success of its top talent. The South American countries have undergone periods of extraordinary growth and success in racquetball. No longer does the birthplace of the sport hold the leader's position in the international scene as the majority of those poised for great things are almost exclusively not from the United States. The discussion about the decline of American racquetball and the sport itself can seem like a revolving door of ideas. The Reaching Your Dream Foundation, a non-profit organization dedicated to helping young male and female athletes enter into the professional arena, strongly believes that the infusion of new players can directly impact not only the lives of players, but also affect match-ups and outcomes on the largest of stages. A case in point is the USA men's doubles team members, Jake Bredenbeck and Jose Diaz, two of these young players chosen and supported by the Reaching Your Dream Foundation for several years, culminating in the highest honor of being Team USA’s doubles team. At the 2016 U.S National Doubles Championships, Diaz and Bredenbeck had a searing run through a draw featuring top teams and players from the country. They were able to overcome every team in route to the title, and earn a spot on the men's national team. This accomplishment would have been very difficult, if not impossible, had it not been for the Reaching Your Dream Foundation. RYDF helps young, promising talent with a variety of resources that can include assistance with air fare, lodging, and entry fees. As difficult as it is to play at their level, it is equally difficult to carve out a living in the sport, especially as an American. Thanks in large part to the donations of generous and loyal players, friends, and fans of racquetball, Diaz and Bredenbeck were able to gain their rightful position as the U.S national doubles team representing their country at the World Games. The perceived decline of U.S racquetball may appear greater than it is because of recent surges in participation and money that has been invested into the sport in other parts of the world. Substantially funded programs like those of Mexico, Bolivia, and Colombia have made those countries more dominant in the sport. For all the conjecture and uncertainty about where the U.S game may be headed, the RYDF has played and is playing a vital part in helping our best talent showcase itself to the United States and now to the world. There would be no Diaz and Bredenbeck in the draw at the U.S Open, the National Doubles, or at the World Games without, to some extent, the support of the RYDF. With the help of RYDF, Jake and Jose proved that they were the best team in the country and not having the best team in the country playing at the world games would be unfortunate for U.S racquetball. The World Games is not only a show of a country’s power but also a proving ground for individual athletes who have their own personal dreams and aspirations. Diaz and Bredenbeck will not only carry the weight of their own goals but also the hopes of their country. We salute Jose and Jake for their dedication and will to win, just as we at RYDF are deeply grateful to donors such as you helping RYDF supported players to reach their dreams. Thank you for your past and future support! Daniel Rojas begins the quest to earn his 2nd title as the #1 High School racquetball player in the United States at the National High School Racquetball Championships this week in Portland, OR. Daniel's first match is today, Friday February 26th at 3:40pm PST. Free viewing is provided on the USA Racquetball Livestream. Please view the video as Daniel talks about how the Reaching Your Dream Foundation has helped him and learn about our newest initiative the Ambassador Program. Jake Bredenbeck (Scandia, MN) and Jose Diaz (Stockton, CA) have qualified for the US National Team by winning the Men’s US Team Qualifying Division at National Doubles this weekend in Tempe, Arizona. Bredenbeck/Diaz. Jake and Jose are sponsored by the Reaching Your Dream Foundation which helps young players develop their careers both on and off the court. In winning, they bested the #1 seeded team of Rocky Carson and Jansen Allen in two very close games, 15-14 15-11. The newly crowned doubles team is slated to represent the United States at the upcoming International Racquetball Federation World Championships to be held July 15-23 in Cali, Colombia. Season of Giving still Delivers! For eight years local Bay Area Racquetball players have celebrated the holiday spirit by having a racquetball tournament where the players bring toys for the children of families who otherwise might not get presents at Christmas. A couple years ago, the Reaching Your Dream Foundation moved the tournament to a larger club and branded it: A Season of Giving. On Saturday December 12th A Season of Giving sponsored a one-day shootout which was filled to capacity of 92 players. Special thanks to Kim Randolph for all her hard work in putting this event together. Lastly, thank you to Dave Ruybalid, Athletic Director at the Big C, for helping us secure his club for our event and supporting the tournament in many other ways. Jake Bredenbeck is having one heck of a year. He describes it as a bit of a rollercoaster. Opening the year, in January, Bredenbeck won the WRT Sonora Open, defeating then No. 1 Polo Gutierrez and becoming the first American in the No. 1 spot on the World Racquetball Tour. That is an incredible way to start the year. The following weekend, at the WRT San Diego Open, he lost in the first round. In speaking with Bredenbeck, he guesses maybe he was burnt out, but he’s not sure what happened. He does know he wasn’t comfortable playing and wasn’t playing well in the weeks following his big win. So, the champ took a few days off, changed his mind set for playing in front of his home crowd in Minnesota for the WRT Midwest Championships and was focused on playing for fun. “I wasn't worried about the other stuff,” like preserving his No. 1 position on the WRT. Of course, the new mind set paid off, he won his second WRT Title at the Midwest Championships in May. The year has continued to have its ups and downs for Bredenbeck. He constantly battles for the No. 1 position on the World Racquetball Tour, and is currently in the No. 2 spot, behind Alex Cardona. He is a consistent semi finalist and finalist on the WRT, but hasn’t won a title since the Midwest Championships in May. Back at the top of another peak of 2015, a monumental accomplishment was going to the Pan American Games to play and represent the United States in singles racquetball. “Winning two years in a row at National Singles has been incredible,” but Jake says it contributed to the roller coaster-like feeling. After winning Nationals this year he wasn’t sure that the qualifying process would ensure he would play in the Pan Ams. It’s a huge deal to represent your country in the biggest racquetball tournament in the world. According to Bredenbeck, the Pan Ams have a different atmosphere, a different set up and that was exciting but it was stressful waiting to find out if he would be a part of the team. When he got the call from the USA National Coach, Dave Ellis, he was filled with a mix of excitement, relief and lots of happiness. Out of all the racquetball moments in his life, he thinks this is the most happiest he’s ever been. He was proud to represent the USA. His parents were also very excited. In fact, they drove up to Canada to support their son. Bredenbeck comes from a family that is particularly loyal to racquetball. Both Jake’s parents, Karen and Bill, are in the Minnesota Racquetball Hall of Fame. His younger brother, Sam, just won the 2015 Junior Nationals in both singles and doubles. Jake comes from a really competitive family who does their best not only in sports but everything they do. It’s ingrained in them. You can further see this by Bredenbeck’s remark that the second happiest moment he can compare to the feeling of going to represent the USA in the Pan Ams is graduating from University of Colorado with his Masters in Business, at age 22. That was a big accomplishment and a proud moment in his life. Sure, he won a couple of junior national tournaments and he’s sure he was excited and happy but these recent accomplishments are outstanding and so fresh in his memory. He’s won two national titles in the last two years and has represented his country to play the sport he loves at the biggest racquetball tournament that only happens once every four years. The racquetball powerhouse pro still has big plans for 2015. To finish out 2015, Bredenbeck wants to get back to No. 1 on the WRT and finish the year in the No. 1 position. If he plays more IRT events, he wants to rise to the top 10 of their ranks. You know what, he wants to win the US Open too. This is a guy who shows up to win, not to just be there, “the US Open is a huge tournament with a lot of big players,” and he is there to play to win. As far as his goals beyond 2015, Bredenbeck wants to continue to grow the juniors programs and support the growth of the racquetball community. He coached several kids, not just his brother, at the Junior Nationals last month in Stockton, California. He wants to help other junior national teams, as he has done in the past, and found he really enjoys it. The biggest obstacle for Bredenbeck in helping the racquetball community is the demands of traveling. He travels a lot for tournaments, and therefore helps out whenever and however he can. He says, “it’s hard to start a juniors program in Arizona (where I reside) but harder because of all the traveling I do.” Life on the road can have it’s challenges, but it allows Bredenbeck to pursue his dreams, and he helps with clinics, lessons and supports the racquetball community in every way he can while on the road.